Now that you have your very own solar system, the solar Investment Tax Credit (ITC) is yours for the claiming. How exactly do you go about it? 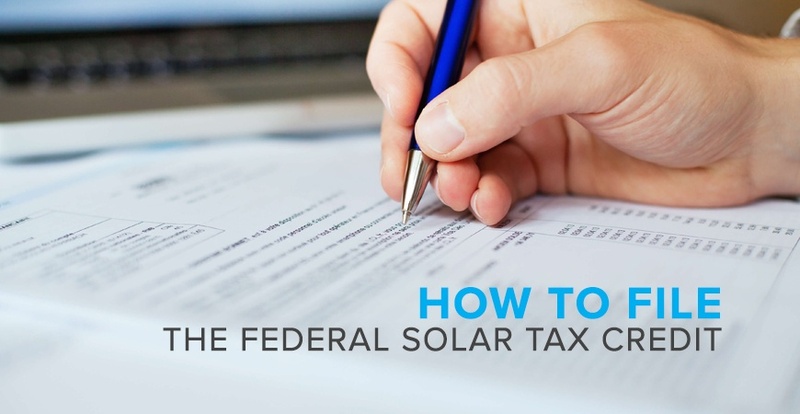 In this post we’ll walk you through the exact, step-by-step process of filing for the federal solar tax credit. Of course, we recommend talking to a tax professional to make sure you’re not missing anything. 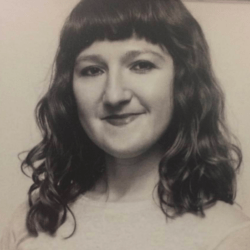 But if you’re a do-it-yourselfer who knows your way around a tax form (or if you’re just curious), this guide walks you through basic filing. What Is the ITC and What Do I Need to File? 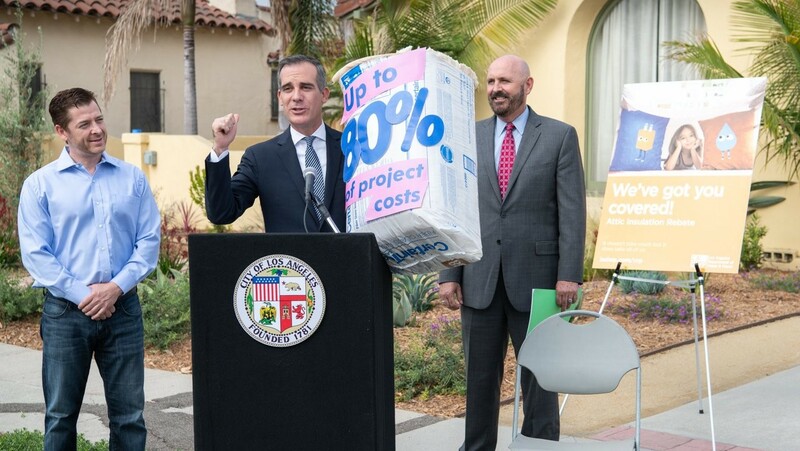 The ITC is a 30% tax credit for homeowners who invest in solar. That’s 30% of what you paid for the system and its installation. 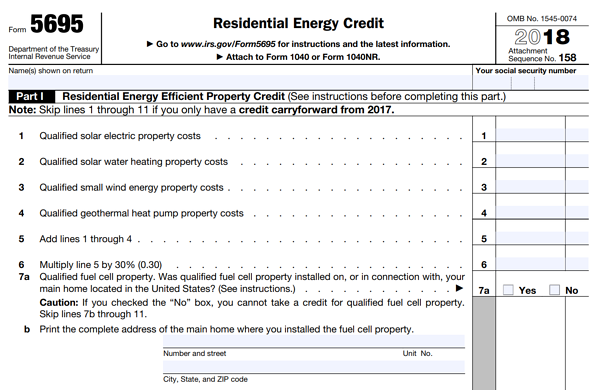 You will need two IRS tax forms (plus their instructions) to file for your solar panel tax credit. Fill in Form 1040 as you normally would. When you get to line 53, it’s time to switch to Form 5695. 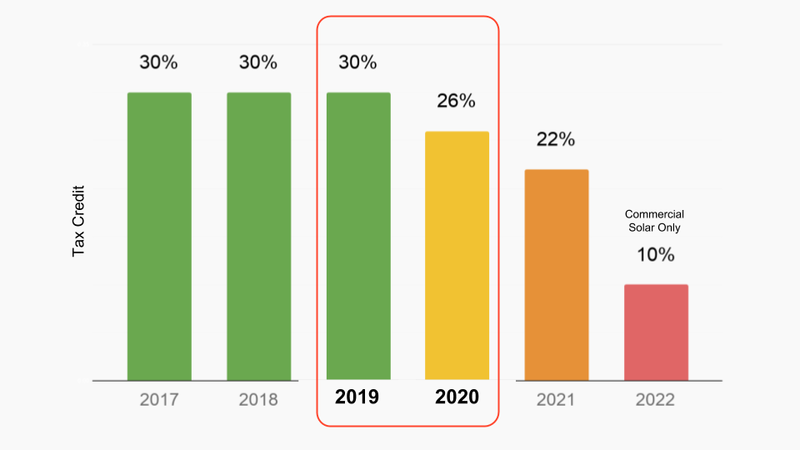 Step 1: Find out how much your solar credit is worth. Enter the full amount you paid to have your solar system installed, in line 1. 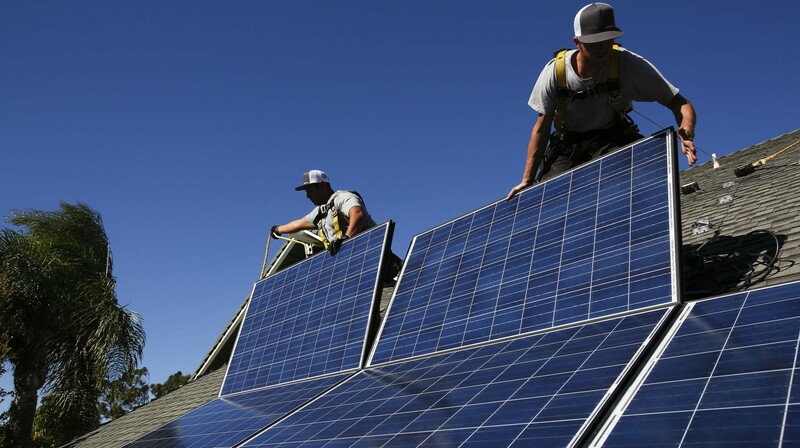 This includes costs associated with the materials and installation of your new solar system. See more detail about how to calculate it here. As an example, we’ll say $20,000. For this example, we’ll assume you only had solar installed on your home. Enter “0” for lines 2, 3 and 4. Line 5 – Add up lines 1 through 4. Line 7 – Check “No.” Again, for this example, we’re assuming you didn’t have any other systems installed, just rooftop solar. Lines 8, 9, 10 and 11 - Don’t apply to you in this example for the same reason. You can fill each with 0 and skip down to line 12. Step 2: Roll over any remaining credit from last year’s taxes. Line 12 – If you filed for a solar tax credit last year and have a remainder you can roll over, enter it here. If this is your first year applying for the ITC, skip to line 13. Step 3: Find out if you have any limitations to your tax credit. Line 14 – For this line, you’ll need to switch to the worksheet at the top of page 4 in the 5695 instructions. Worksheet Line 1 – Enter the total taxes you owe (you found this out earlier and entered it into line 47 on your 1040 form). 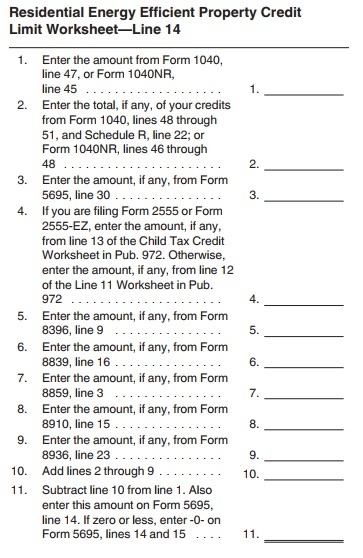 Worksheet Lines 2 through 9 – If you’re claiming other tax credits, enter them here. For simplicity, we’ll assume you’re not doing so. Worksheet Line 10 – Add up lines 2 through 9. Worksheet Line 11 – Subtract line 10 from line 1 to find the amount of the credit you can claim this year. Once you have this number, enter it into line 11 of the worksheet. Step 4: Find out how much of the remainder (if any) you can roll over into your tax return next year. See more info on rolling the ITC over here. Almost done! Switch back to your Form 5695. Line 14 – Enter the number from line 11 of the worksheet. Line 15 – Enter the lesser number of line 13 or 14 (it depends on what your total tax bill is vs. your total tax credits). Line 16 – Find the difference between lines 15 and 13 to see if there’s any credit to carry forward for next year. In our example, it zeros out. Step 5: Apply the amount found in Form 5695 to your tax bill on Form 1040. Last step! Write the amount from Form 5695 line 15 into line 53 of Form 1040. Of course, this walked you through filing for a pure solar panel installation tax credit. If you had other solar or renewable systems installed, like a new geothermal or solar water heaters, there would be more to add in. Hopefully, this gave you a clear idea of the steps involved and it demystified the process. Read more about the ITC and its qualifications here. If you have any questions, give us a call at 888-454-9979. Or connect with one of our solar specialists through chat or email. 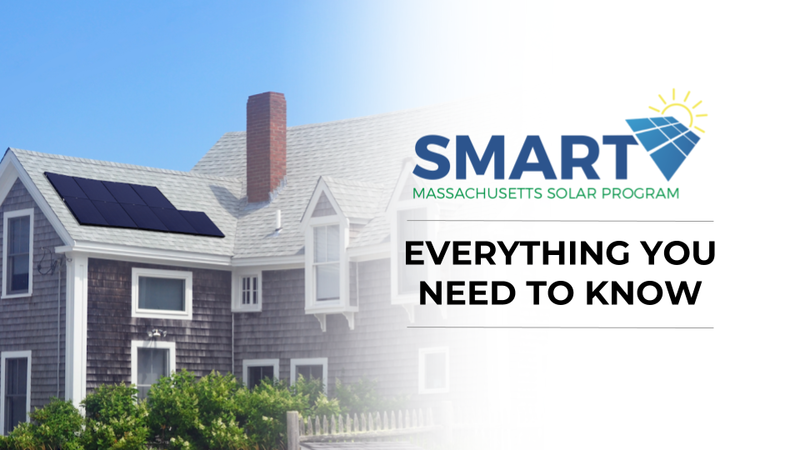 We’re happy to share more solar tax credit info.